How do leaders beat “Beginners’ Hell”? Get to know about…KING OF JAZZ! *Who is one of the most influential Jazz musician in Thailand? SHORT ANSWER: His Majesty King Bhumibol Adulyadej (Rama IX). His love and skill for Jazz music manifest through his compositions (from 1946 onwards), mastery of multiple musical instruments, formation of royal jazz band, establishment of local jazz radio station in 1952, and collaborations with Jazz Legends (e.g. Benny Goodman) in 1960s. Many bands, both local and international, still continue to perform tributes to His Majesty’s music to this day. Various cover versions of his popular songs are available on streaming services such as Spotify and Apple Music. Try your best to resist the charm of his music! His Majesty King Bhumibol Adulyadej was renowned for various accomplishments as an inventor, photographer, writer, and sailor. Nevertheless, one of his most influential works lies in jazz music. His Majesty developed his passion for jazz music while growing up in Switzerland. According to his sister (Princess Galyani Vadhana), King Bhumibol began to have interest in music at the same time as his older brother (King Ananda Mahidol, Ram XIII) when they heard her playing the piano. Their initial interest was brief and later rekindled when they attended a grand concert in Arosa, Switzerland. Inspired, the brothers soon bought a second-hand saxophone for 300 Swiss francs. However, only King Bhumibol actually attended the music classes. Initially, King Bhumibol learned Classical music and opted for wind instruments such as saxophone and clarinet. He later switched to Jazz music since it provides him more room for improvisation. This passion resulted in his first composition at the age of 18. His Majesty’s first song was written in April of 1946, titled “Candlelight Blues” (แสงเทียน). Within the same month, he wrote a more polished second song “Love at Sundown” (ยามเย็น). His third was “Falling Rain” (สายฝน), another popular song among Thai listeners today. Upon His Majesty’s return to Thailand in 1950, he formed his own band “Lai Khram” (วงลายครามalternate spelling: “Lay Kram”). The band members regularly meet with the King on weekends at Klai Kangwon Palace (พระราชวังไกลกังวล) for private jam sessions. These sessions are so intense that sometimes they lasted until sunrise. In 1952, His Majesty established a radio station within the Amporn Sathan Palace (พระที่นั่งอัมพรสถาน) and named the station “Au Saw Radio Station” (สถานีวิทยุ อ.ส.) after the initials of the palace. Through broadcasting, Lay Kram band thrilled its radio audience with vibrant selections of popular Jazz tunes. When the band members of Lay Kram band grew older, new members were recruited. The band was later renamed the “Au Saw Friday Band” (วง อ.ส. วันศุกร์) by the King and gave live performances on the air every Friday. For regular programmes, King Bhumibol scheduled the music timetable and handpicked the records. Occasionally, listeners were allowed to make call-in requests to the band. Even after he was crowned, King Bhumibol continued to produce a steady stream of compositions, with tracks such as “Blue Day” (อาทิตย์อับแสง), “Dream of Love, Dream of You” (เทวาพาคู่ฝัน), and “Love Light in My Heart” (แก้วตาขวัญใจ). Over the period of five decades, King Bhumibol composed over 78 songs. 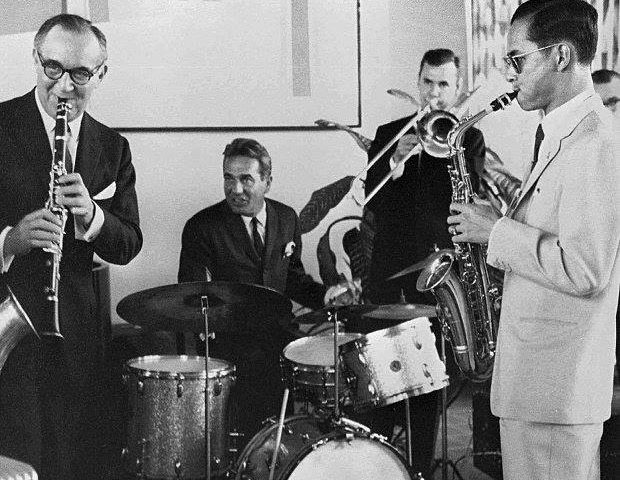 In 1960, King Bhumibol played his saxophone alongside legends including Benny Goodman, Gene Grupa, Stan Getz, Lionel Hampton and Benny Carter in jam sessions when he visited New York. Lionel Hampton once said, “He is simply the coolest king in the land”. Internationally, his compositions had been featured by world-class orchestras at concerts worldwide, such as the Madrid Classical Orchestra of Spain, NHK Band of Japan, and Broadway theatres in the United States. Today, the Au Saw Radio Station is located at the compound of Chitralada Royal Villa (พระตำหนักจิตรลดารโหฐาน) within Dusit Palace (พระราชวังดุสิต). The king’s compositions can often be heard at social gatherings and are performed in concerts even today. Various cover versions of his popular songs are available on streaming services such as Spotify and Apple Music.